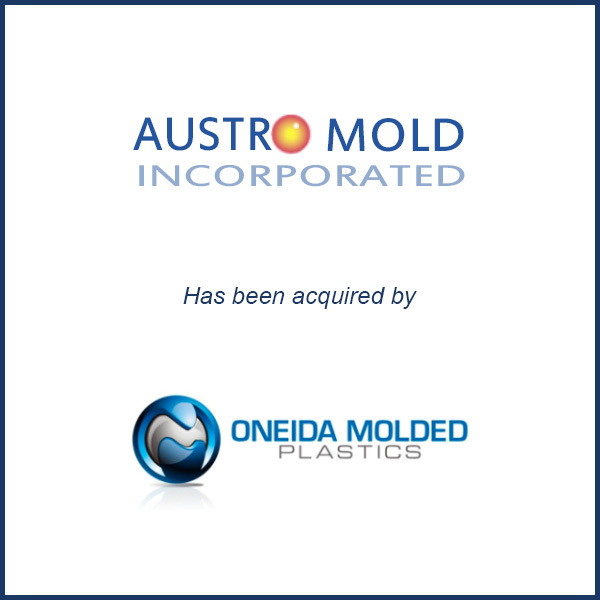 Rochester, NY – April 2015 – Oneida Molded Plastics, LLC of Oneida, NY has acquired the assets and business of Austro Mold, Inc. of Rochester, NY. Austro Mold is a custom injection molder and mold maker serving OEM customers in the healthcare, military, electronics and filtration industries. The company operates out of a 40,000 square foot building in Rochester, NY and utilizes 25 injection molding machines up to 550 tons. Oneida Molded Plastics (OMP) is a custom injection molder and mold maker that serves OEM customers in the sporting goods, healthcare, power generation and electronics industries. OMP utilizes 34 injection molding machines from 35 to 700 tons and maintains over 90,000 square feet of manufacturing space at its Oneida plant, which it has operated since 1964. Molding Business Services served as the financial advisor to Austro Mold in connection with its April 2015 sale to Oneida Molded Plastics. An article was written in Plastics News on this transaction. Click here to read the article.